It's a rarity to see us in crop tops before the scorching hot summer has well and truly arrived, especially as we aren't as brown as we would like to be, but this weekend has been beaut and we thought we'd rock some crop tops with our lovely culottes which are super comfortable and can be worn with, pretty much, everything! Now what screams summer more than exotic fruit and bright colours?!LAZYOAF! We couldn't wait to showcase our new numbers from Lazy Oaf! I got myself an oversized turquoise blue dress with drawings of naked ladies all over it (Just the look I was going for haha) whilst Jords rocked the pineapple crop t-shirt! I love the randomness and vibrancy of their clothes and these perfect items for summer festivals. I mean who doesn't love a pineapple or a naked lady? It's a conversation starter at least! It's fair to say that black has always been our favourite colour. It's timeless, flattering for the figure and goes with pretty much everything! We've always been the type to dress according to comfort and mood, and black is always a thumbs up! These outfits can be dressed up or down, not sure about you guys but we'd wear these outfits during the day or for an evening soiree with a few accessories to glam it up. What's your favourite outfit from the below? Just a casual Sunday at the Collyer house hold! 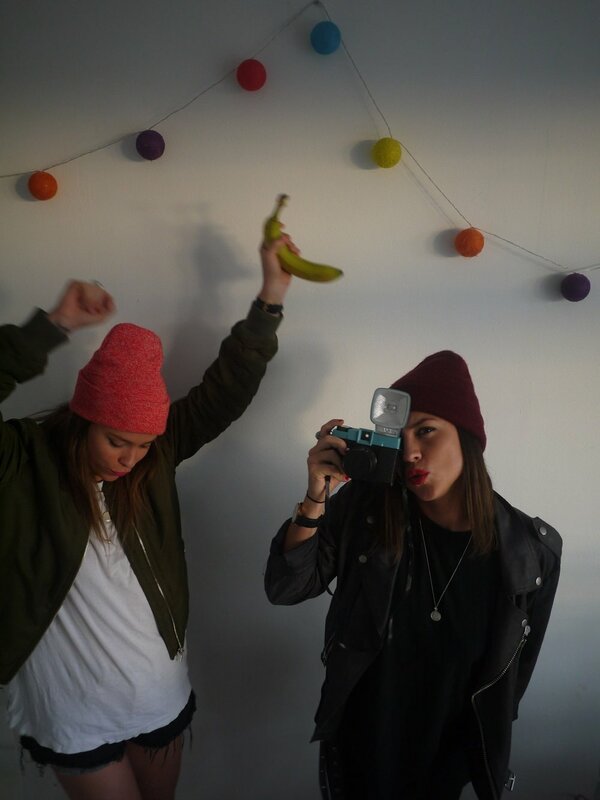 We thought it would be fun to have an indoor party with a few random props.. and staying true to the name of our blog post, we thought it was only fair to get the banana involved!